The ballpark home of the West Virginia Black Bears is expected to be ready by the start of short season next June. After more than 2,500 suggestions and over 10,000 fan votes online, Rich Baseball Operations announced today that the West Virginia Black Bears™ has been chosen as the name of their new NY-Penn League franchise. 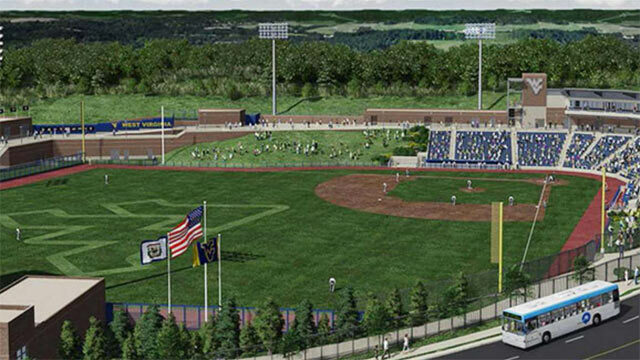 The West Virginia Black Bears™ will take the field for the first time in June of 2015 at the new baseball-only ballpark that will be shared with the Big XII WVU Mountaineers baseball team. The Black Bear is the official state animal of West Virginia and lives in all 55 counties of the state. The Black Bear is large and ferocious, but is also a highly intelligent animal, which can both outwit and outsmart its opponent, giving it many advantages to earn victory. This is already the second "victory" for Black Bears™ in West Virginia. It was by popular vote in 1954 that the animal was chose as the state's official animal. Since then, the population of black bears has steadily increased in the state. "We are very excited to begin our identity as the West Virginia Black Bears™ and continue moving forward to Opening Day 2015," said Matt Drayer, General Manager of the Black Bears™. "We want to thank all the great baseball fans of West Virginia for their tremendous support and engagement throughout the naming process." "We would also like to thank Dr. Dallas Branch and the West Virginia University Graduate Sports Management Program Sports Marketing Class for their efforts and teamwork in executing our fan voting contest." Branch, along with graduate students Andrew DiPietrantonio, Kristen Furlong, Brett Ervin and Manuel Garcia-Oronoz, were instrumental in the execution and success of the 'Name the Team' contest locally. West Virginia Black Bears™ was chosen after over 2,500 name suggestions were received through online and paper ballots at United Bank and Clear Mountain Bank locations during a two-week span in September. Fans were then encouraged to log online from October 3-10 and vote from a Top 10 list for their favorite name. In all, over 10,000 votes were received with Black Bears™ coming out on top as the new name for the franchise. During the 'Name Suggestion' period of the naming contest, the team received over 2,500 unique and fun suggestions for a new club moniker. Several fans made the suggestion of Black Bears™ or of some variation of the new team name. Among those suggestions, Dan J. of Philippi, WV was selected by a random lottery to receive four complimentary season tickets for the entire 2015 inaugural season. The Black Bears™ staff will also be contacting the first 500 fans who submitted a name during the first part of the contest. Each will receive a complimentary ticket voucher for a game during the 2015 season.